Just like facial skin having oily and dry zones is known as ‘Combination Skin’, hair that exhibits such mixed behaviour is known as ‘Combination Hair’. Which problem do you target when you have two completely different types of hair on your head? You end up compromising with only one hair issue at a time. For people with combination hair, they might use two shampoos to target the two problems – light, clarifying shampoos target oily roots but cause hair ends to be dry. Rich moisturising shampoos target the dry ends but may be too rich for the scalp, resulting in build-up that makes the scalp oily. Moreover depending on the thoroughness of scalp massage during shampooing, the scalp build-up may not be thoroughly washed of, further causing the scalp to feel oily in a shorter time. Introducing – Essential Light Finish Volumizing (yellow) and Deep Cleansing Care (blue) variants brings the best of both worlds to you! With the optimum combination of Smart Cuticle Care & Sebum Cleansing Technology, you can now achieve moisturized hair ends while maintaining a refreshed breathable scalp! 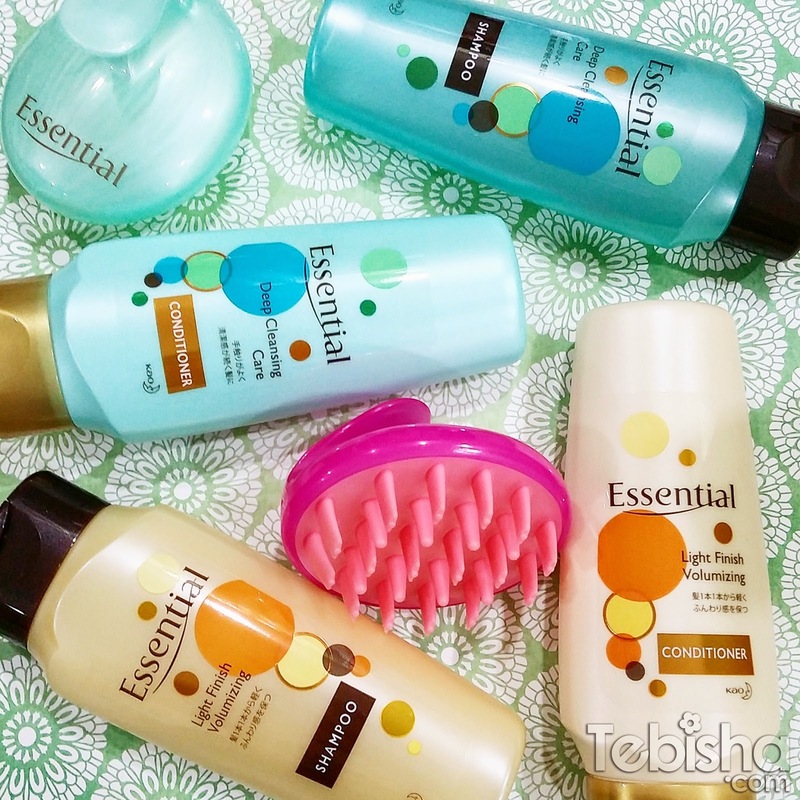 The new improved Essential range brings the best of both worlds to you! With the optimum combination of Smart Cuticle Care & Sebum Cleansing Technology in the Light Finish Volumizing and Deep Cleansing Care variants, you can now achieve moisturised hair ends while maintaining a refreshed, breathable scalp! – Optimum combination of Smart Cuticle Care & Sebum Cleansing Technology for airy light roots and moisturised ends. Now you can have a scalp massage without going to the salon! For those who have the habit of painting their nails, using the brush to wash your hair helps prolong your manicure as you do not need to use your fingers to massage your scalp. For a limited time only, Essential is also giving out a massage shampoo brush with purchase of shampoo and conditioner. Essential Shampoo 750ml + Conditioner 750ml with free Massage Shampoo Brush in hot pink or mint green available from mid-May 2015 at all leading supermarkets & and personal care stores for $19.60. Follow Essential on Instagram at @essentialsingapore for updates!